When choosing eyeglass frames at Blink Eyecare in McKinney Texas it can be a wonderfully fun, educational and entertaining experience. 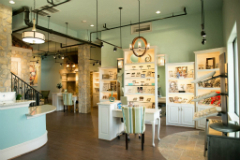 At Blink Eyecare in McKinney Texas, looking for the perfect Eyeglass Frames doesn’t have to be challenging. McKinney, TX, have you been in for your eye test his year? Many people aren’t aware of the importance of having an annual eye test. Here at Blink we have a two part test. The first part involves Dr. Gaddis assessing whether or not your eyes need correction by figuring out your personal prescription. That’s the part of the eye test most patients are familiar with. Are you having problems seeing objects far away or with driving, and need a comprehensive eye exam? You might have myopia. Myopia is the term for nearsightedness. People with myopia see more clearly when objects are close, while distant objects appear blurred or fuzzy.